If checked only Snapshots with different file versions will be shown below. If checked only Snapshots with file versions equal to the Snapshot on the right will be shown below. Calculate checksums to decide if file versions are equal or different with List only different Snapshots or List only equal Snapshots to. This takes a lot more time but is more accurate, too. Restore the file/folder from the selected Snapshot. Will be grayed out if Now or multiple Snapshots are selected. Delete the file/folder from one or multiple selected Snapshots. Will be grayed out if Now is selected. Select all Snapshots except Now. Lists all Snapshots which contain the file/folder. 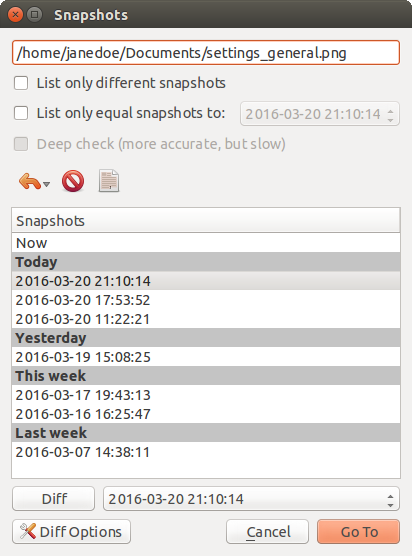 Can be filtered with List only different Snapshots or List only equal Snapshots to. Open a Side-by-Side view of the file/folder in the Snapshot above and the Snapshot in the right hand selection. Change the Program which is used for the Side-by-Side view with Diff. You can use %1 and %2 for the paths of both Snapshots. Return to the Main Window and show the file in the above selected Snapshot.